Radio FrequencyInterference (RFI)Immunity No alarm or setup on critical frequencies in the range of 26 MHz to 950 MHz. Four‑wire smoke detector with an isolated 135°F (57°C) heat sensor and a sounder. Four‑wire smoke detector with a 135°F (57°C) heat sensor. Four‑wire smoke detector with a 135°F (57°C) heat sensor, an auxiliary relay, and a sounder. Four‑wire smoke detector with a 135°F (57°C) heat detector and an EOL relay. Four‑wire smoke detector with a 135°F (57°C) heat sensor, a sounder, and an EOL relay. Four‑wire smoke detector with a 135°F (57°C) heat sensor and a trouble relay. 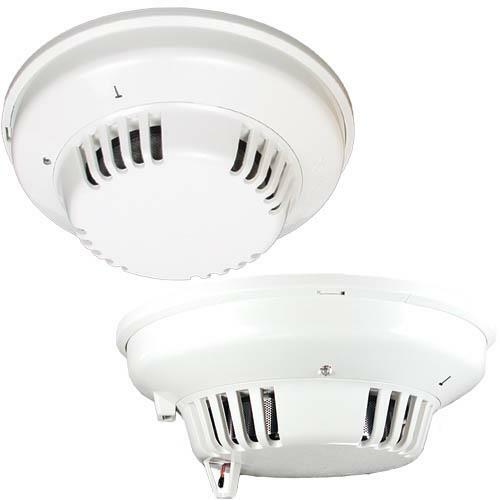 Four‑wire smoke detector with a 135°F (57°C) heat sensor and a sounder. For retrofit and remodeling purposes; 16.2 cm (6 in.) diameter. Not Available.